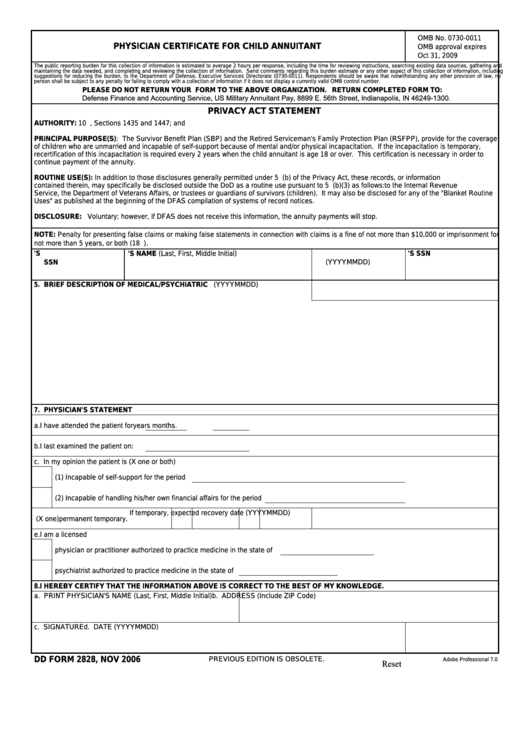 Download a blank fillable Dd Form 2828 - Physician Certificate For Child Annuitant in PDF format just by clicking the "DOWNLOAD PDF" button. Complete Dd Form 2828 - Physician Certificate For Child Annuitant with your personal data - all interactive fields are highlighted in places where you should type, access drop-down lists or select multiple-choice options. person shall be subject to any penalty for failing to comply with a collection of information if it does not display a currently valid OMB control number. Defense Finance and Accounting Service, US Military Annuitant Pay, 8899 E. 56th Street, Indianapolis, IN 46249-1300. AUTHORITY: 10 U.S.C., Sections 1435 and 1447; and E.O. 9397.
continue payment of the annuity. Uses" as published at the beginning of the DFAS compilation of systems of record notices. DISCLOSURE: Voluntary; however, if DFAS does not receive this information, the annuity payments will stop. not more than 5 years, or both (18 U.S.C. 1001). 8. I HEREBY CERTIFY THAT THE INFORMATION ABOVE IS CORRECT TO THE BEST OF MY KNOWLEDGE.